Posted on November 10, 2015 Author JennieEllis	No Comments on Miracles Do Happen…. When I met Jean Marc six years ago, I immediately knew he was a rock star. Confident, driven, and committed to his schooling, he knew where he was going in life. He had embraced the fact that he could never farm because of his disability so he put all his effort into his academics. Sometimes I would have to encourage him to take a break as he read the English/Creole dictionary into the wee hours of the night. He has been known to look at the back of the granola bar wrapper and try to have a deep discussion with me about the chemistry (that Ca for Calcium and Fe for Iron stuff I have no recollection of) and continue to try to teach me until I learned it. Those were some very long sessions, driving in the back of the pick up truck, and precious to me regardless of my lack of interest in chemistry. He seemed to have a grasp on all aspects of his life, except his disability. Until two years ago, Jean Marc had never seen a doctor. No one had ever been able to explain to him why his legs were deformed and he was so short. In Haitian culture, they often attribute disease to some kind of curse because they do not have the opportunity to be exposed to explanations we get from going to the doctor. At that time, we sent him to Dr. Frank Bertram who lived across the street from me for the majority of my childhood in Lakeland, Florida. He was doing medical missions work in Dominican Republic and agreed to see Jean Marc. This involved getting a visa, a passport, and going across the border from Haiti to the Dominican Republic. Not a small feat but accomplished nonetheless. Frank was able to diagnose him with ” severe bilateral bowleg deformities secondary to skeletal dysplasia.” Surgery was not possible in the hospital where he was working. We figured out how to manage his pain to some degree, but most days the pain was close to unbearable. The day I told Jean Marc we could not correct his condition he hung his head and a single tear rolled down his cheek. It was the first time I realized how difficult life was for Jean Marc. The mom in me mourned for my helplessness. 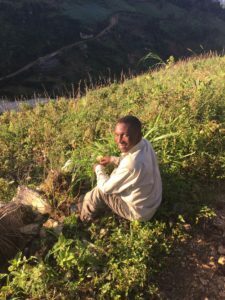 Two years have passed since his initial diagnosis and I have sent him to other missionary doctors in Haiti, but all with the same conclusion- no possibility of surgery. Although I think that Jean Marc felt encouraged that we were always searching for answers, I also think he was falling deeper and deeper into despair. 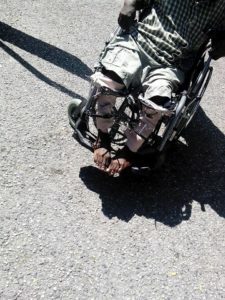 The lack of mobility, the pain, and the tiring days walking to and from school and other times trying to navigate transportation where his legs were not even long enough to hoist him up into the truck had taken its toll. When I talked to Jean Marc a month ago, he had returned to the farming village with his parents because he could not afford school. With only a year left of high school, he felt desperate to be in finish and go on to university. After I traveled there a week later we made arrangements for him to start the school year. Perfect! Oh, and I had this doctor’s appointment for him the week after I left but was completely convinced it would be the same result- no surgery. 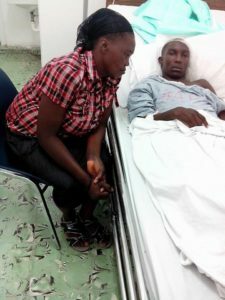 He went to the appointment on Wednesday, October 28th and that afternoon my team in Haiti called me. They had scheduled surgery for Jean Marc. WHAT??? I figured I had lost the information somehow in translation and kept asking questions to hopefully get the real answer. After two days of probing, I realized it was true. They were performing surgery on Friday. To be honest, I was a bit concerned about what they were going to do since this was the first time we had been told that any procedure would benefit him. But Frank Bertram had highly recommended him and I fully trusted his judgement. So after a restless night and much prayer, Friday came and surgery was performed. The Taylor Spatial Frame (TSF) is an external device for limb correction, lengthening and/or straightening that is based on the Ilizarov Method. 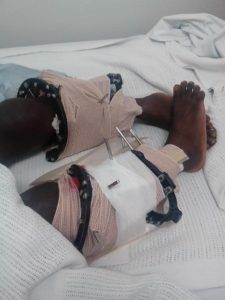 This device and technique is a mainstay of pediatric musculoskeletal deformities at Hopital Adventiste. This external fixator takes advantage of the body’s natural ability to grow healthy new bone tissue and gives the surgeon the ability to accurately move bones to their correct precise anatomic alignment. 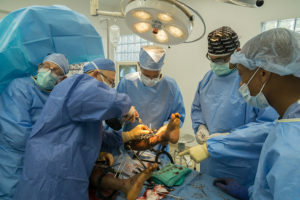 The TSF fits around the patient’s limb and is attached to the bone with pins or wires that extend from the rings, through the skin and bone to the other side. Rejoicing happened in the Ellis household and spread like crazy to all the people in our community who love Jean Marc- some of whom have never even met him. The Gerbers, the Bowers, the Bertrams, Savannah, and many others were having a time of celebrating this amazing opportunity for Jean Marc…..but we also knew the road to recovery was going to be very long and painful. Soon after the surgery his mom came down from the mountain to take care of Jean Marc and his little brother, Reginald, who had a less invasive surgery. The always joyful Madame Anselme I know was struggling to watch her sons in pain. Jean Marc’s favorite quote is, “When you make well, it is not easy.” We talked about that on the phone- how what is best for us is often the most difficult path at the time but leads to the biggest blessing in the long run. Through it all, his precious personality continues to make him the truest overcomer I have ever met. From phone calls to selfies, I watched him persevere through the process. 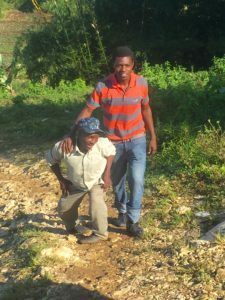 After a week in the hospital, he was released with his mom who was trained in how to help Jean Marc work the frames to continue to straighten his legs. It takes a lot for me to call something a miracle….but this is one of those times. A child who was told his whole life he would never be anyone because he was a “cripple” has had the opportunity of a lifetime to correct his disfigurement. 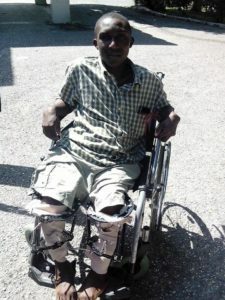 He will never be fully able bodied but any correction that can be made to his legs is a miracle to Jean Marc and all of us who call him our own. Previous Previous: The Struggle is Real….